Most sunburn is a first-degree burn that turns the skin pink or red. Prolonged sun exposure can cause blistering and a second-degree burn. Sunburn never causes a third-degree burn or scarring. Direct sun exposure. Warning: clouds don't help. 70% of UV light still gets through on cloudy days. Reflected sun rays. From snow 80% is reflected, from sand 20%, from water only 5%. Tanning lamp or sun lamp. Tanning bed. A common cause in teens. Sunburn is an inflammatory reaction of the skin. Ibuprofen is a drug that can block this reaction. It can reduce the redness and swelling. But, it needs to be started early. Sunburns are sneaky. Many parents are surprised when their child gets a sunburn. Reason: there are no warning signs while the burn is occurring. Redness (sunburn) often is not seen until 4 hours after being in the sun. The pain and redness keep getting worse. They don't peak for 24 to 36 hours. Lesson: if you think your child got too much sun, start ibuprofen then. Give it 3 times per day for 2 days. Don't wait for redness. Most sunburns do not blister. Most blisters can be treated without needing to see a doctor. For pain relief, give an ibuprofen product (such as Advil). Start this as soon as you can. Reason: If started within 6 hours, it can greatly limit the pain and swelling. Must give for 2 days. Caution: Not approved for age under 6 months. Use 1% hydrocortisone cream (such as Cortaid) as soon as possible. No prescription is needed. Put it on 3 times per day. If used early and continued for 2 days, it may reduce swelling and pain. Use a moisturizing cream or aloe vera cream until you can get some. Use creams only. Avoid putting ointments on red skin. Reason: They can block the sweat glands. Burned skin can be very painful. Covering it with a cream can give great relief. Use cool wet washcloths to the burned area. Do this several times a day to reduce pain and burning. For larger sunburns, give cool baths for 10 minutes. Caution: Avoid any chill. Can add 2 ounces (60 mL) baking soda per tub. Do not use soap on the sunburn. Offer extra water on the first day. This helps to replace the fluids lost into the sunburn. This will also help to prevent dehydration and dizziness. Caution: Leave closed blisters alone. Reason: To prevent infection. For broken blisters, trim off the dead skin. Use a fine scissors cleaned with rubbing alcohol. For any large open blisters, use an antibiotic ointment (such as Polysporin). No prescription is needed. Remove it with warm water. Then, reapply it 2 times a day for 3 days. Pain stops after 2 or 3 days. Use a sunscreen with an SPF of 15 or higher. Fair-skinned children need a sunscreen with an SPF of 30. This is especially true if your child has red or blond hair. Put sunscreen on 30 minutes before exposure to the sun. This gives it time to get down into the skin. Give special attention to the areas most likely to become sunburned. Examples are the nose, ears, cheeks, and shoulders. Put sunscreen back on every 3 to 4 hours. Apply often while swimming or if sweating a lot. A "waterproof" sunscreen stays on for about 30 minutes in water. Most people use too little sunscreen. The average adult requires 1 ounce (30 mL) of sunscreen at a time. The best way to prevent skin cancer is to prevent sunburns. The skin of infants is thinner than the skin of older children. It is more sensitive to the sun. Sun avoidance is best for children under 6 months. Stay in the shade. Sun avoidance or sun proof clothing are best for children 6 months to 3 years. That means clothes that fully cover the arms and legs. Also, have your child wear a hat with a brim. When a sunscreen is needed, infants can use adult sunscreens. The FDA hasn't approved their use under 6 months old. However, the AAP supports their use at this age. There are no reported harmful side effects from today's sunscreens. To prevent sunburned lips, apply a lip coating that contains sunscreen. If the nose or some other area has been burned often, protect it completely. Use zinc oxide or titanium oxide ointment. Protect your child's eyes from the sun's rays and cataracts with good sunglasses. Some children are at higher risk for sunburn. If your child has red or blond hair, he is at higher risk. Fair-skinned children and children who never tan are also at higher risk. These children need to use a sunscreen even for brief exposures. They should avoid sun exposure whenever possible. Avoid exposure to the sun during the hours of 11:00 AM to 3:00 PM. This is when the sun's rays are most intense. Caution: When overcast, over 70% of the sun's rays still get through the clouds. This shows a second degree burn on the face. The area is red, raised and blistered. Move the victim to a cool shady area. If possible, move into an air-conditioned place. The victim should lie down. Elevate the feet. Undress victim (except for underwear) so the body surface can give off heat. Sponge the entire body surface continuously with cool water. Fan the victim to increase evaporation. Give as much cold water or sports drink (e.g., Gatorade, Powerade) as the victim can tolerate. 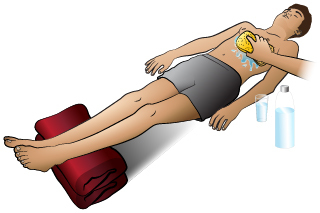 An adult or teen with heat exhaustion should drink 2-3 cups (480-720 ml) of liquids right away to replace what was lost. Then the adult or teen should drink approximately 1 cup (240 ml) every 15 minutes for the next 1-2 hours. This shows a first-degree sunburn on the chest. It is red without blistering.